Ron Rose was born in Vancouver, Washington, on September 4, 1994. Before becoming a professional poker player, Ron Rose had spent time in the Air Force and also worked at the New York Stock Exchange. Ron Rose started playing tournament poker in 2000. Ron’s first money finish was at the 2001 World Series of Poker in the $1500 Pot Limit Omaha event. Ron Rose would win his first WSOP bracelet in 2003 at the Seniors No Limit Holdem event. In late 2002, he finished 6th at the World Poker Tour World Poker Finals event. Later on in the 1st season of the WPT, Ron Rose would win the World Poker Challenge event. He then went on to victory in the WPT Battle of Champions, which is his favorite tournament victory to date. Ron Rose also learned the importance of having poker players definitively state what their action is. He learned this lesson the hard way when he went up against Amarillo Slim in the 2001 World Heads Up Championship in Vienna. Ron Rose had pushed all-in and Amarillo Slim said “Let’s Go,” and turned his hand over. Ron gleefully turned over a better hand, thinking Amarillo Slim had called. Amarillo Slim then said that he had meant “Let’s go on to the next hand,” and that he had never called. The tournament director ruled that since Amarillo Slim never said the word “Call,” that Ron Rose had acted prematurely and that Amarillo Slim could still fold. 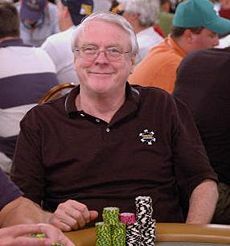 Ron Rose has cashed in 57 times with his winnings totalling to $1,128,172 as of August, 2009. Ron Rose currently lives in Dayton, Ohio. He has a wife, three children, and four grandchildren.